For the first times in our lives (not!) Joe disagreed with me. He has considerable cred here, having worked on Christmas tree farms in Pennsylvania and obviously knows much relative to conifer success in Ohio. And he is a Soils Man. His point was that in his main area of southwest Ohio area, as well as in areas of northwest Ohio, with soil pH being much more alkaline than in my main area of northeast Ohio, Canaan fir and Nordmann fir were better choices. Good point. 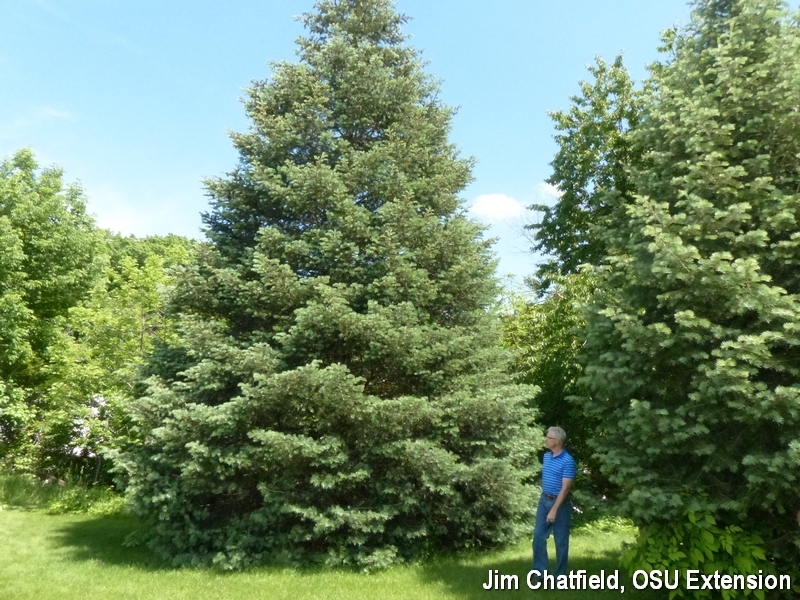 It depends upon “of which Ohio we speak.” But for northeast Ohio and more acid soils, white fir is a marvelous tree. This large conical fir typically grows to 30-50 feet and half as wide in the landscape, though some approach 100 feet in height. Upper branches tilt upward, lower downward. Needles have a light green to silvery blue appearance. White fir prefers well-drained soils rather than heavy clays and thrives in full sun exposures, though it can tolerate moderate shade. It is an adaptable evergreen with a softer look and feel than the more rigid spruces in the landscape.